The luxurious, all-inclusive, adults-only Sonesta Ocean Point Resort on the Caribbean island of Sint Maarten is in full swing. The five-star, all-suite resort brings posh style and exemplary service to the most spectacular locale on the southernmost point of the island. 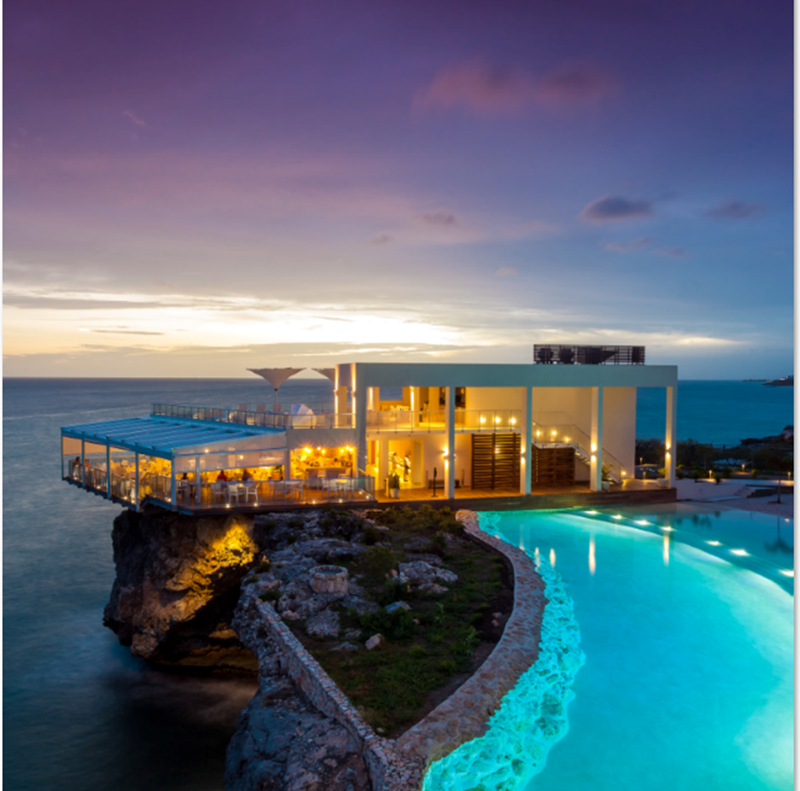 And there’s something else it’s bringing to island lovers who are ready for some pampering and fine cuisine in a stunning setting: the brand-new Azul Restaurant. This magnificent dining venue is perched atop a cliff overlooking Maho Bay. Outside, it’s an architectural confection, resting elegantly against a backdrop of crystalline blue waters. Inside, you’re greeted by Caribbean casual: a sleek, contemporary design of whitewashed walls and cerulean blue accents with sweeping view of the sea through walls of windows. But that’s not the best of it: Upstairs, the rooftop lounge offers breathtaking views and modern seating with full bar service, ideal for special events and private functions. And, if you can’t make it to St. Maarten their liquid artists have the perfect creation to bring the beach to you. Azul’s Executive Chef Marc Innocenti cooks up his creative interpretation of authentic Greek, Spanish, North African, French and Italian specialties, with an extensive wine list of Mediterranean and New World vintages. To celebrate the grand opening of this magnificent restaurant, we asked Chef Innocenti to share one of his irresistible recipes. Enjoy! Wash and prepare rice to be cooked in saffron broth. Cook and immediately cool rice after cooking. Chop and prepare all other ingredients. Sauté garlic and onions and chorizo until translucent and sausage is caramelized. Add all seafood with the exception of head on shrimp. Deglaze pan with white wine and add the saffron rice. Grill head on shrimp. Prepare presentation skillet by heating on stove top or in oven. Present finished dish in the heated skillet tableside and garnish with fresh chives and grilled head on shrimp. Hi Leigh! We are delighted to hear you wish to return. Please email your request to reservations@sonesta.com. Thank you. We look forward to welcoming you back. We spent our honeymoon at this amazing resort in 2015. We loved it so much and are coming back 4/2016 for our 1 year anniversary. We can’t wait to experience the resort as it is now completed and can only imagine how much more it has to offer. See you soon Sonesta Ocean Point Resort, and all of the wonderful staff!! Hi do u serve kosher meals?